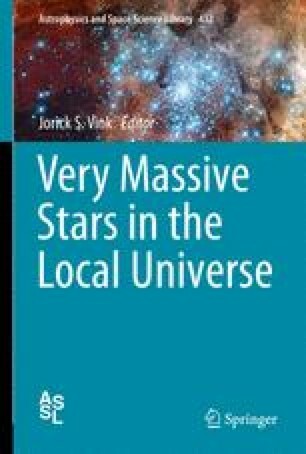 The theory underlying the evolution and death of stars heavier than 10 M⊙ on the main sequence is reviewed with an emphasis upon stars much heavier than 30 M⊙. These are stars that, in the absence of substantial mass loss, are expected to either produce black holes when they die, or, for helium cores heavier than about 35 M⊙, encounter the pair instability. A wide variety of outcomes is possible depending upon the initial composition of the star, its rotation rate, and the physics used to model its evolution. These stars can produce some of the brightest supernovae in the universe, but also some of the faintest. They can make gamma-ray bursts or collapse without a whimper. Their nucleosynthesis can range from just CNO to a broad range of elements up to the iron group. Though rare nowadays, they probably played a disproportionate role in shaping the evolution of the universe following the formation of its first stars. We thank Tuguldur Sukhbold and Ken Chen for permission to include here details of their unpublished work, especially Figs. 7.1, 7.6, and 7.8. This work has been supported by the National Science Foundation (AST 0909129), the NASA Theory Program (NNX09AK36G), and the University of California Lab Fees Research Program (12-LR-237070).